Never... Never... Never Disturb A Singing Bird. A singing bird is a sign of baseline and a bird will sound an alarm when disturbed. When the bird alarm is sounded, all the other wildlife will pay attention. Depending on the distance of the alarm, the intensity of the alarm and the significance of the alarm, all the other wildlife will respond accordingly. IF THE BIRD ALARM IS DUE TO YOUR PRESENCE, YOUR OTG PHOTOGRAPHY OPPORTUNITIES WILL BE LIMITED AS MOST OF THE WILDLIFE WILL MOVE AWAY FROM YOU. The song of a bird is peaceful and indicates a state of contentment. 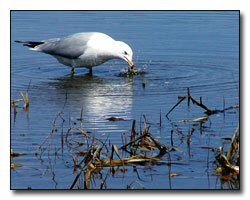 Remember, the birds that should be studied are the birds that feed on the ground and stay close to the ground. A bird singing at the top of the trees will continue to sing even if a cat is close by. If a bird is not in any significant trouble due to a predator, the bird will continue to sing. You might say, "But there are so many birds to learn". But, you do not have to know all the birds and you do not even have to be able to identify the bird based on its song. All you have to know is whether the birds are in baseline or in state of alarm. The song is also a territorial behavior of the birds. It indicates that "This is my area and don't come around into my territory", whether the bird is referring to wildlife or a person. The song only applies in the spring and into early summer. Birds struggle all their lives to find food and to stay warm. The birds do not waste any energy as wasted energy is dangerous and could lead to death. So, when a predator appears in the area, the birds in the top of the trees will continue to sing while the birds below will stop singing and possibly sound an alarm. So, don't become confused when some of the birds at the top continue to sing. They are not threatened by a predator on the ground. The companion call is a rhythmic pattern between a male and female bird. The companion calls are not indicated in the field guide books. It is a peaceful interaction since it flows back and forth from the male and female bird. The birds might be saying "What a beautiful place this is." And the reply from the female might be "It sure is". Or, "Come on over here. There are a lot of berries to eat." And the reply might be "I'll be right there." The companion call indicates baseline. But, if the male calls to the female and the female does not answer, the male will call again in an irregular pattern or possibly a little louder. If the female finally hears the male and calls back, the call pattern will go back to the rhythmic pattern and baseline will return. 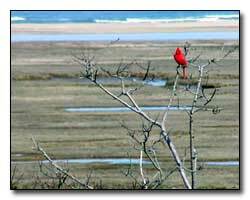 An easy bird to listen to is the cardinal. 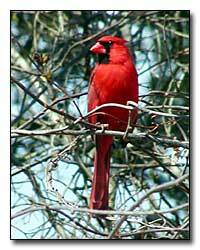 The male cardinal will call chip, chip and the female will return the call with chip, chip. If the companion calls are interrupted and irregular due to your intrusion, the wildlife in the area will listen and respond accordingly. Male to male aggression occurs when a male comes into another male's territory. The first male, who has mapped out an area, is telling the intruding male that this is my space and I would appreciate if you would leave. The birds chase each other around the area and you will hear much noise between the two birds. But, this still indicates baseline. But, if you approach and the birds sense danger from you, they will stop male to male aggression and many of the wildlife in the area will listen and respond accordingly. Begging calls are heard when the young birds are usually being fed in May and June. If you happen to see a robin uncovering a worm on the ground and the bird flies away with the worm, there are young robins nearby. If the robin eats the worm, there are usually no young birds near. But if you happen to hear a begging bird, don't assume it is baseline since the young birds are usually not smart enough to stop begging when a hawk is close by looking to catch a young bird. The voice of alarm from the birds can help the OTG Photographer as well as hinder. If the voice of alarm is sounded due to a predator, it is a possible photography opportunity for you. For instance, if a gray fox is in the area and the birds sound the alarm, it is a photography opportunity for you. So, it is important to recognize if the alarm is sounded due to your presence or a wildlife presence. Also, if no alarm is heard, it is an opportunity for OTG bird photography since the birds will be in baseline and they do not feel threatened by you or a predator. There are many degrees of alarm. If a friend taps you on the shoulder.. you turn around and the friend says "Haa". There will be one type of alarm reaction. If a friend hides in your closet... you open the door and the friend says "BOOO!" There will be another type of alarm reaction. If a friend scares you and you think it is a life or death situation, there still will be another type of alarm reaction. So, the seriousness of the predator is based on the degree of the alarm. Don't listen to the jays or the crows since they are the birds most commonly seen and heard. Those birds are tricksters and they are very sneaky. Both of the birds might be silent in an area since they rob nests and eat birds or eggs. One last thing. When you drive to an area and you are all excited entering the woods, notice what happens when you jump out of your car, slam the door and walk at a fast pace toward the woods. Many the birds will fly high into the trees and stop their singing. It is because you create turmoil in the area and the birds can read your body language. It is the same as throwing a pebble into the center of a still pond. Many concentric rings will appear originating from the spot that the pebble entered the water. And everything within that area (a floating leaf, a duck, a floating stick, etc.) will be affected by each moving ring. The pebble is similar to you entering into the woods. You set off concentric circles and many the birds and animals respond accordingly. Finally, learn to walk invisibly in the woods and more photography opportunities will exist. Learn to recognize when a song bird is disturbed. Usually, the bird will lift its head and change its body posture indicating to you that I don't want you to approach me any more. Turn away from the bird, don't look at the bird and walk in another direction (circling the bird). Once that bird learns to trust you, the bird will go back to baseline. Learn to understand and respect the ways of the birds and more OTG photography opportunities will exist. The five senses of walking, seeing, hearing, touching and smelling are discussed in the "Seeing With Outdoor Eyes" section (located on the above tab). Outdoor Eyes teaches you how not to disturb birds by being able to see and hear them in advance. The understanding of bird language along with the use of Outdoor Eyes enables you to have better OTG photography opportunities. Learn about the languages of the birds.